Summary: Ten months in Syria's popular uprising, parts of the country have fallen out of government hands and into the control of the "Free Syrian Army," a group made up mostly of defectors from the national military. Meanwhile, Syria has been been suspended from the Arab League due its government's failure to stop using violence against unarmed protesters. 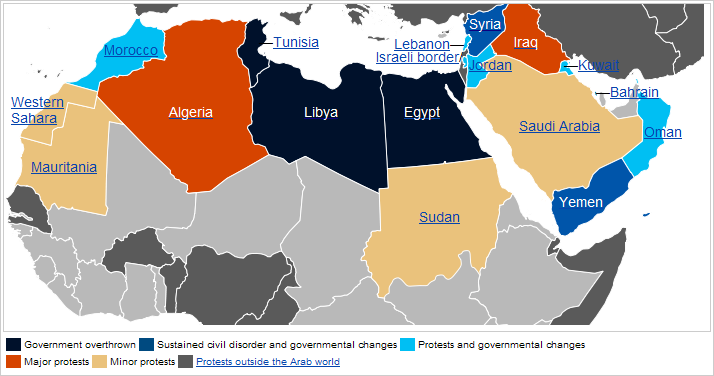 The "Arab Spring" has brought incredible upheaval to the the Middle East and North Africa - first the Tunisian and Egyptian dictatorships fell to peaceful protesters; then Libya became embroiled in a civil war, while Yemen too began to fragment under opposing forces. Now, Syria has become the third country in the region to be divided between warring armies, as the 10-month-old uprising has given way to formidable armed resistance from a growing network of military defectors calling themselves the "Free Syrian Army" (FSA). World. Map is from this Wikipedia page (public domain; original graphic). All the while, the rebels were hitting targets closer and closer to the capital city of Damascus, until finally in January they successfully seized the nearby city of Zabadani. Fighting around the capital escalated quickly, with the FSA spreading its control across most of the suburbs of Damascus by January 27. Over the next few days, Assad's government launched a largely successful offensive to take back the areas surrounding the capital, though the rebels still claim control of Douma, Damascus's most populous suburb. 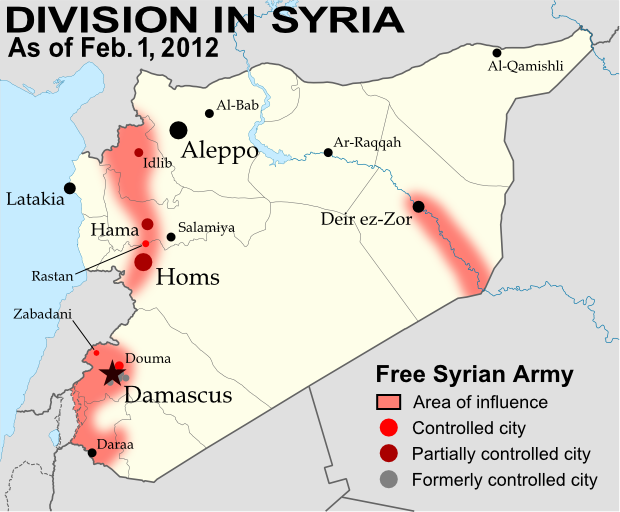 The cities of Homs and Idlib are also reported to be largely under FSA control, along with much of rural Idlib province. And the territorial division in Syria may be even more extensive than we know - journalists have been forbidden to enter the country, making it difficult to follow developments on the ground. The Arab League, with Syria in lighter green at top right. 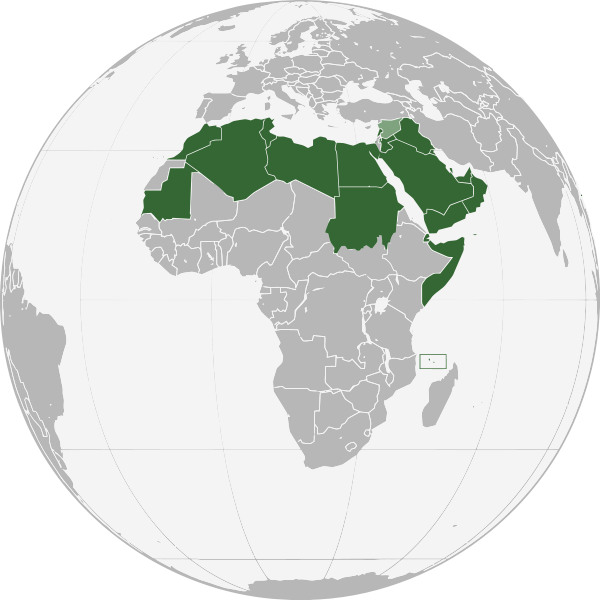 The League of Arab States (better known as the Arab League), an international organization of which Syria is a founding member, has taken a close interest in the events unfolding within the country. In November, the body voted to suspend Syria's membership unless President Assad brought an end to the violence against civilian protesters. Assad failed to follow through with any concrete action, and the country was suspended from the League. In January, the organization sent a delegation of observers into Syria to examine the situation; they were allowed inside the country, but eventually were forced to leave due to escalating violence between government forces and the FSA. As the region's main representative body, the Arab League will likely be a major player in any future decisions by the international community to intervene in Syria's civil war.